View of Keauhou Bay and Kahaluu Beach State Park. Kayak rentals available at Keauhou Bay, minutes from the home. This house was amazing, spacious and comfortable! Our family of 5 adults from Alberta spent 10 days in February 2019 in this house and everyone loved it! Has everything you need and more! Would definitely recommend and will be returning. Thank you so much for allowing us to host your Hawaiian vacation. We look forward for your return! Awesome view with a great pool! It is a great place to stay, could use some updating but once you see the view you forget all about that. Perfect house for family with kids; pool, game room is the plus. Great view of sun set, and beaches. Close to everything. Our family of 10 stayed in this beautiful house and enjoyed it very much. It was well located to many activities, beaches and restaurants. The view was spectacular as was the beautiful private pool. Plenty of space as well as a game room with full sized billiard table and a foosball table. We highly recommend this house to all especially families or multiple couples.Located in gated community making it private and quiet. Thank you for choosing to enjoy your vacation at our home. We look forward in hosting your family and friends again in the near feature. This home was perfect for our family of 5. Very spacious, private, and relaxing. From the moment we made arrangements with the assistant throughout our stay and even making special arrangements for our party, this was a wonderful Hawaii experience. Can't wait to do it all over again. The home was very clean and inviting. The breath taking view from the pool deck is just absolutely amazing. You can even hear the waves crashing at night from the pool deck and master bedroom as you drift away. Thank you Jerry, Evone, and Shari. 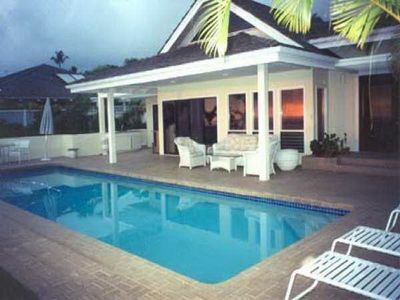 The home is only minutes from downtown Kailua-Kona, beaches, surfing, snorkling, jet skiing, parasailing, scuba diving, and Kona's world famous deep sea fishing. World class golf courses (Waikaloa, Mauna Lani, Hapuna and Manua Kea and others) are all located within a 45 minute drive. The Big Island's volcano remains active with brilliant glowing flows of red hot lava into the ocean. Volcano National Park is located a pleasant two hour drive to the south. Mauna Loa's Kleck Observatory, one of the world's most prestigious, is located a two hour drive to the north. Airport Distance: 15 minutes.